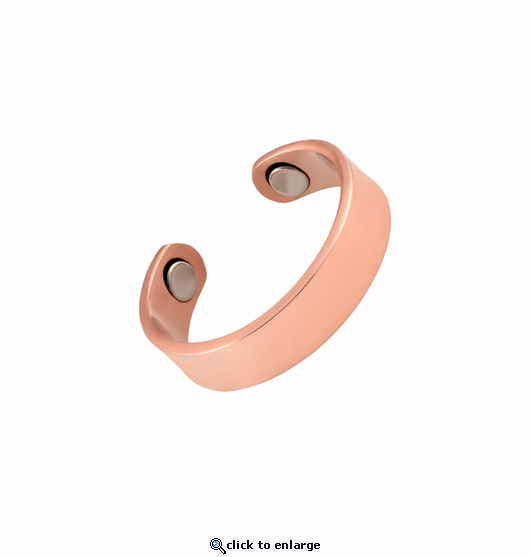 This is a shiny solid copper adjustable magnetic therapy ring. It is made of pure copper with no color plating. It has a 1500 gauss neodymium rare earth bio north facing magnet on each end. It will fit small to medium finger ring sizes about 6 - 9.
i was skeptical about the use of this magnetic ring until my son bought it for me and challenged me to try it. It really works! I can maneuver my fingers that are in pain constantly but when I wear the rings the pain is diminished. I use the bracelet as well. I am buying several of them to give to my sisters who have the same problem as I do. This ring is very pretty and works very well. I have carpal tunnel and this is exactly what I needed to keep my pain manageable!